"In a perfect world you wouldn't have to lug heavy cat litter around," I tell my sis, as I'm climbing the steps to her house, with one bag grasped in my right hand, one in my left and a third wedged under my arm. "They'd use the toilet like everybody else. "I've just realised what men are for," she tells me, as she opens the front door. "Being handy around the house?" I say. "More specific," she says, leading the way through to the little room at the side, designed as a coalhouse in all these council-houses built in the 1950s, and now used exclusively by her ageing cat. "Lifting heavy objects," she says. "You must have found other uses for men over the years," I say, dropping the bags in the place she indicates and rubbing my left shoulder. "Of course," she says. "But they come at too high a price. 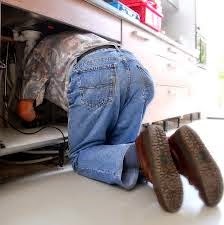 You'll be wandering around in the morning and you'll trip over his legs, because he's rootling under the sink for his snub-nosed sprockets or something. "Then you have to consult him if you want to go to an antique fair, and it turns out he'd rather go to an old steam-engine rally. I can't be doing with joint decisions." She shakes her head briskly, switches the kettle on and pulls a couple of mugs out of the cupboard above the cooker. "Marmalade jars," she says. "They're also good at opening new jars of marmalade that are sealed too tight for me," she says. "And punctures." "I've had loads of punctures over the years," she says. "What happens is I get out and look at it, projecting a subtle air of helplessness, then I rummage around in the boot, then I go back and look at it again. By this time six guys are pulled up on the verge, arguing about who got there first and who can do it best. I've never changed a puncture in my life." "That's exploitation," I say, taking the mug of hot coffee from her hand and reaching for a chocolate chip cookie. "It's division of labour," she says. "Men change tyres, open jars and do the heavy lifting. Women raise kids and do the planning and thinking." "Companionship," I suggest. "You must miss having someone to talk to on long, cold winter evenings." "I miss having someone to warm my feet against on long, cold winter evenings," she says. "You can't talk to a man. You have to listen to him. They tell jokes, for heaven's sake. Jokes and stories. Again and again. The same ones. I think most men are slightly brain-damaged. Probably from banging their heads on the pipes under the sink." "I had no idea you hated men," I say. "I don't," she says. "I like men. They can be sweet and cute and handy and helpful - at the right time and the right place. But that is not inside my house." "Unless you want cat-litter lifted or jam-jars opened," I say. "Exactly," she says. "So what I suggest is we stop letting men wander all over the place, getting under people's feet and making a mess. Instead they should be kept in storage and brought out only when you need them." "Good thinking," I say. "You'd have one in the boot of your car, stowed away in the spare-tyre compartment, which you'd have to sound-proof so you couldn't hear his stories on long drives." "That's it," she says. "And one in the shed at the bottom of the garden, for when you wanted the grass cut and the hedges clipped." "And one attached to every new jar of marmalade," I say. "Who you'd recycle with the jar when it was empty." "And he's six feet tall and wearing a fireman's uniform," she says with a dreamy smile. "Now that's what I call a perfect world."